In 1933, the Royal Institute of British Architects ran an open competition for Bexhill Corporation to find a suitable architect for their proposed new seafront entertainment complex – the first such competition to be held in Britain. It attracted 230 entries and was won by Erich Mendelsohn and Serge Chermayoff. The De La Warr Pavilion takes its name from the ninth Earl De La Warr (pronounced Delaware), Bexhill’s socialist mayor from 1932-35, who oversaw the project with great personal interest. Mendelsohn, a German Jew who had come to Britain to escape the Nazis, was already famous for producing strikingly provocative Modernist masterpieces. The Pavilion’s clean horizontal lines set the scene from the outside but it’s the smaller internal features that do it for me – especially the staircases. The helix staircase on the south side complete with elegant chrome pendant light is without doubt my favourite part of the building though the protruding cantilever north staircase does come close. The orange/gold terrazzo floors make the building feel remarkably solid despite it being very open in places due its soaring expanses of glass. Not only was the Pavilion revolutionary in terms of aesthetics but also in terms of engineering – it was the first major welded steel-framed building in Britain. The great tragedy of this story is that the Pavilion of today is just part of Mendelsohn and Chermayoff’s original scheme which should have included, amongst other things, a lido and pier on the south side. The missing sections have led to the dullness of the Pavilion’s slab-sided north ‘façade’ which is the first thing that many visitors see. An eight storey hotel and prominent cinema should have flanked the plain wall but were never built due to funding problems. A second great tragedy was narrowly missed in the 1980s when there was actually talk of demolition following a long period of neglect. 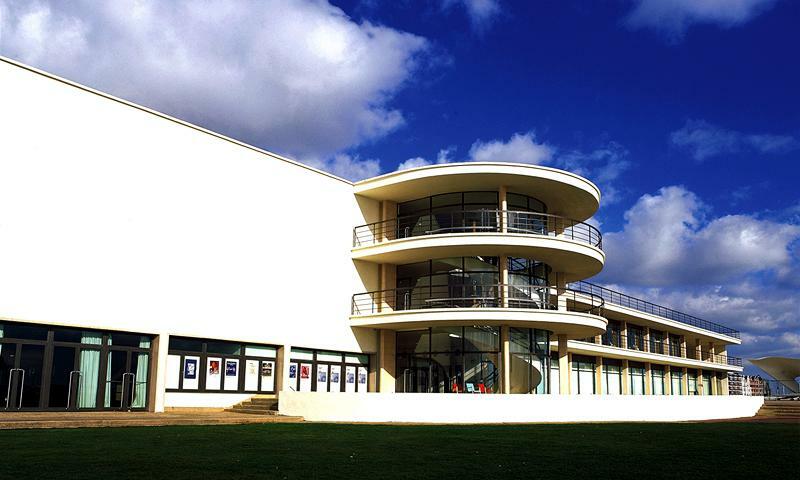 The Friends of the De La Warr Pavilion managed to secure Grade I Listed status for the building and also won National Lottery funding to pay for the bulk of a complete restoration by acclaimed architects John McAslan & Partners. It was John McAslan who told me personally about the project with such passion and vigour that I jumped straight into the car and drove straight to Bexhill to see the De La Warr Pavilion for myself! I can vouch that it is well worth a trip. See www.dlwp.com for details.